Vintage Shure 55 "Elvis Mic"
Up for consideration is an original vintage Shure "Elvis Microphone" along with a new 20' cable. I recently found this mic at a pro studio microphone sale, so I don't have much experience or expertise with this kind of mic. 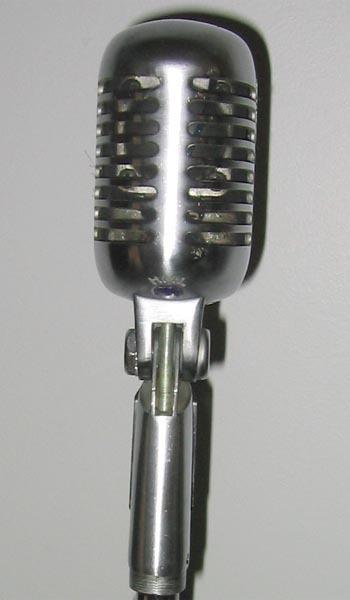 It appears to be some kind of Shure 55 mic, but it is mounted on a base that is labeled "Sure Model 51 Sonodyne Dynamic Microphone." 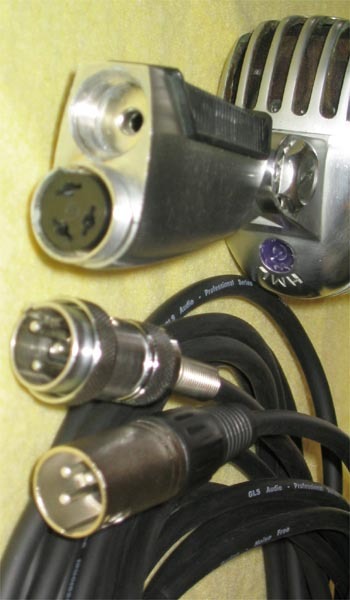 It has the original 1950s 3-pin connector, and the new cable is NOS Amphenol 3-pin to double strain relif XLR. 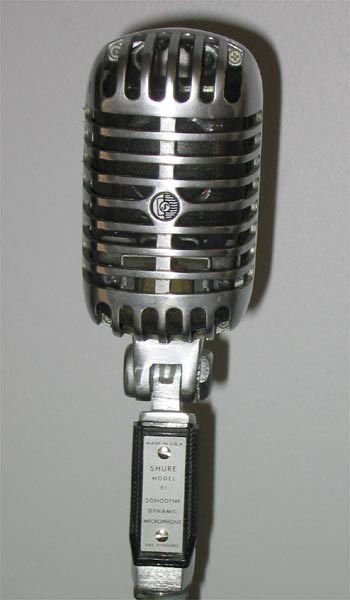 I do not know if the mic is a Shure 55, 55s, 55sw or 55sh, or if it is an unusual version of the Shure 51. Please email me if you know which it is and I will update the description. Click HERE for additional photos. There is a purple plastic plug in the back of the mic under the designation HML, so it looks like this model either originally had an impedence selector switch that has been plugged at the factory or otherwise repaired or removed -- or this particular model came stock from Shure without the switch, or the impedence was set at the factory -- I just don't know. The Shure 51 base is labeled "Patent Pending" and I can find no serial numbers anywhere on the mic. There is no on/off switch. 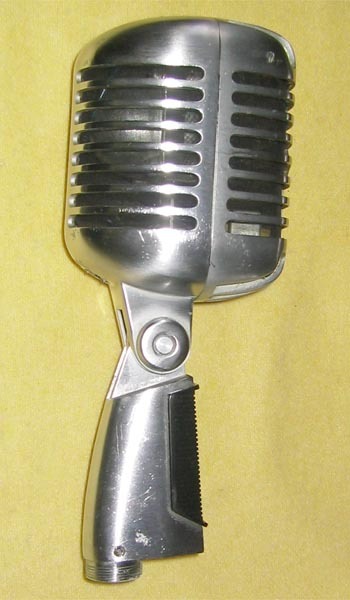 This mic went out of production in 1978, and it is in excellent condition for being 30+ years old. It did come from a pro studio that took meticulous care of all their mics. There is one small ding on the upper right corner of the nic's right side, and a few very minor scratches elswhere. 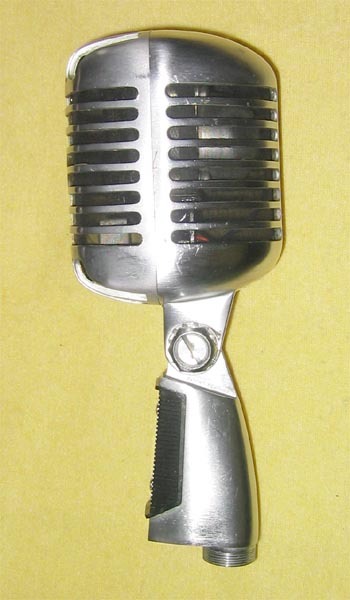 This is a great looking mic for someone who wants the look and sound of a vintage Elvis mic -- and it is perfect for a vocalist who wants that look onstage or in the studio. 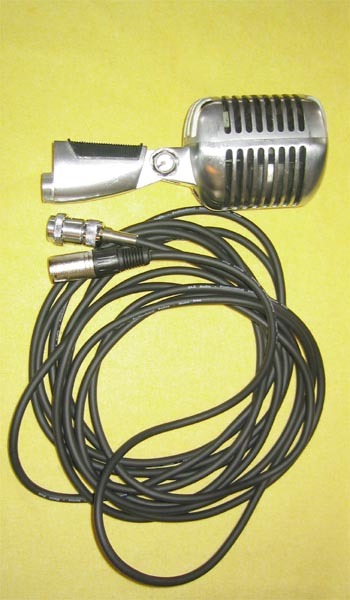 But I am neither a vocalist or a vintage mic collector (unless it is a Neumann or a Schoeps), so I'm selling it in hopes that it will find a new home with either somebody who will use it or appreciate it, or to a collector. Includes new 20' cable, but not a mic stand. Click HERE for additional photos.  USA insured shipping is $15 via FedEx Ground. Please ask about international shipping. This mic is guaranteed to work, but all sales are final, so please ask any questions first. I accept PayPal, Money Orders or Personal Checks. Thanks for looking.